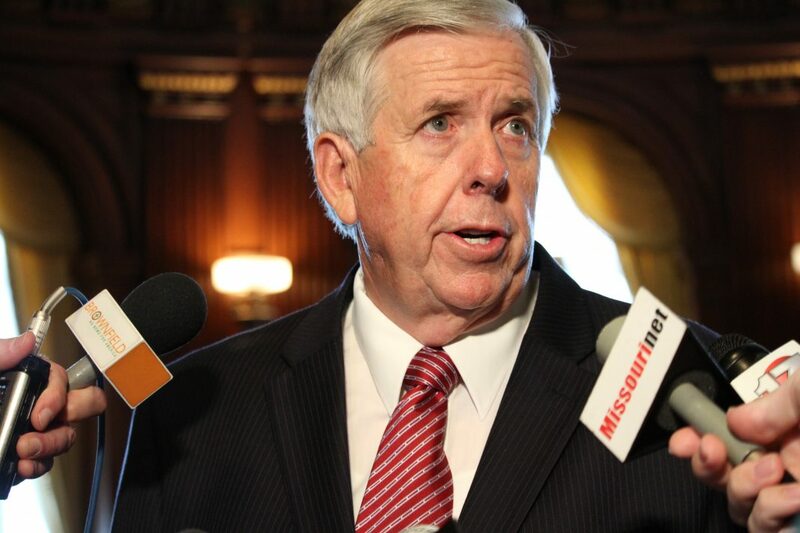 JEFFERSON CITY — Missouri’s 57th governor took over the office in a time of turmoil in the state, but Governor Mike Parson’s hope is to bring unity back to the state. With the statewide officeholders, Cabinet members, the Missouri Supreme Court and members of Congress looking on, Parson spoke to the legislature in a special joint session for the first time. Parson took over as governor following the resignation of former Gov. Eric Greitens on June 1, 2018, rising from the Office of Lieutenant Governor. “Today is a time for a fresh start for our state and to recommit ourselves – each and every on of us, including you in the galleries – we must work together for a better Missouri,” he said, receiving a rousing round of applause from the chamber. “We faced difficult truths, we made tough decisions, we persevered because our institutions are strong and the people of Missouri are stronger,” he said. Parson spoke of the importance of public service, and the duties and responsibilities of serving the citizens of the state. “Make no mistake: the offices we now hold are far bigger than any one of us,” he said. “When the public’s trust is violated, we are obligated to act,” Parson said, saying he had been impressed by the care, prudence, and professionalism of those serving in the legislature over the past session. He called the present day an opportunity for a fresh start and recommit to the values of Missouri’s government. “This does not mean disregarding our beliefs or moderating our positions. It means debating with respect. It means conducting ourselves with integrity. It means unifying around the idea that – no matter which party we belong to – each of us is here for the same reason: to make Missouri a better place,” he said. Parson called the past legislative session “one of the most historic legislative sessions in recent memory,” referencing the work of the legislature on such issues as tax reform, record education funding, union reform, and a balanced budget. ‘“This is how government should work, and this is the people’s government and – all of us in this room – can ensure that it continues to work in the years ahead,” Parson said. Parson pledged to ”spend every day working to make our state stronger and more prosperous,” and promising to make the welfare of the people his guiding principle and sole consideration. “And I will never forget – never forget – that public service is – first and foremost – is about serving Missourians,” he said. In closing, Parson referenced the words of President Abraham Lincoln in the final days of the Civil War, saying that he was optimistic that Missouri will move forward “with malice toward none, with charity for all, with firmness in the right, as God gives us to see the right, let us strive on… to finish the work we are in… to bind up the nation’s wounds,” a sentiment that brought the entire room to their feet with applause. Upon the Governor’s departure, the legislature officially adjourned from the first special session of 2018.